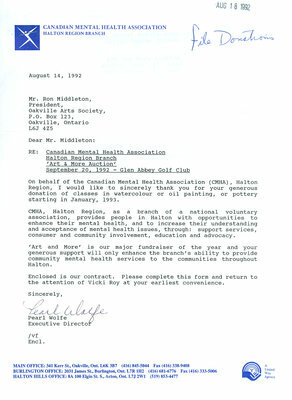 A donation of classes in either watercolour, oil painting or pottery is made to the Canadian Mental Health Association - Halton Region Branch. 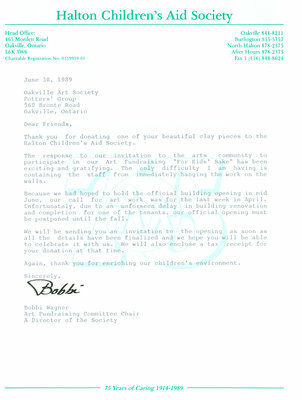 The Halton Children's Aid Society writes to thank OAS for their donation of pottery works to be part of the Art Fundraising Event "For Kid's Sake" and a painting for their new building. 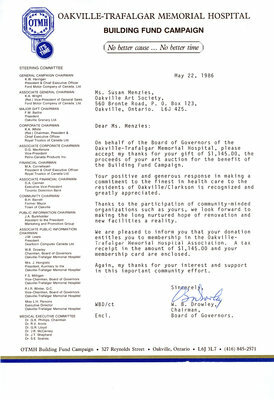 This letter from the Oakville Trafalgar Memorial Hospital gives thanks to OAS for their donation of $1,1450 to be put towards the Building Fund Campaign. The money was raised at one of the Society's Annual Art Auctions. The Oakville Art Society has relied on help and donations from those in the community. Whether it was a donation of materials for renovations or donation of time, OAS could not be where it is today without the help of others. Because OAS has an understanding of what it means to need support from the community they in-turn have gone on to 'pay-it-forward' by donating to many causes in the Oakville and surrounding area. As well as donating to charities and organizations in the community, OAS also has donated scholarships and classes to art students in the Oakville area.